Now we can proced with the next step. Now we have to tell our PHP installation that it should use eAccelerator. 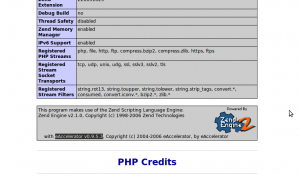 The configuration files for the PHP 5 modules are stored in the /etc/php.d directory. So we create the file /etc/php.d/eaccelerator.ini. The configuration files for the PHP 5 modules are stored in the /etc/php5/conf.d directory. So we create the file /etc/php5/conf.d/eaccelerator.ini. Hi, I have tested “APC”, “eAccelerator” & “XCache”… XCache was faster then the others.